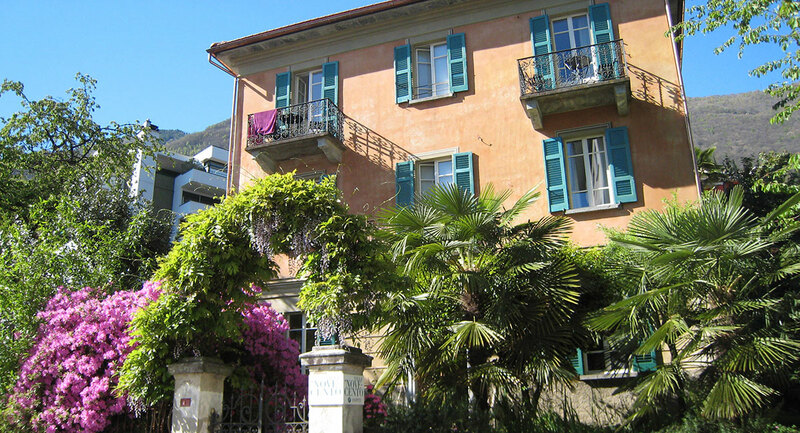 The Swiss Heritage Society has named Villa Novecento in Locarno as one of the 100 most beautiful hotels in Switzerland! The building itself is set amid a wild, romantic garden. A pergola, a rose pavilion, a gnarled olive tree – there are lots of secluded spots that are perfect if you wish to while away the time relaxing and reading. The Villa Novecento is surrounded on all sides by a wildly romantic, over 500 m² garden, with many secluded and cozy spots. A quiet place in the middle of Locarno, and a unique city oasis. The archway by the entrance gate is wrapped in wisteria, azaleas bloom in rich colors and the rosemary shrubs grow luxuriantly on the doorstep. Flowers and medicinal herbs grow in the herb garden. The typical Ticino pergola to the east, provides shade and sweet fruits… the ideal place for breakfast at sunrise. The gnarled old olive tree, encompassed by a drystone wall, sets a worthy accent in the west. Besides that, a cork tree, a group of palm trees, camellias and oleanders grow, which gives the garden a southern flair. The rose-entwined pavilion gives the garden a delicate and intense smell.